Sophie Hitchon goes in search of a third-successive senior hammer title this weekend at the British Championships at the Alexander Stadium in Birmingham. And she can also rubber-stamp her place at the Rio Olympics with a place in the top two. 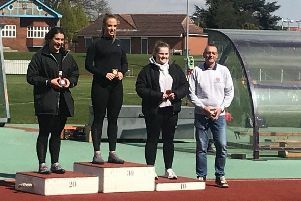 Sophie goes to Birmingham in excellent form so far this season, haviung started her year with 70.65m in Kingston, Jamaica, before subsequently throwing three Olympic standards – 71.63m in Halle, 71.71m in Beijing, and her best of the season to date, 71.86m in Szczecin, Poland at the weekend. She said on her twitter page: “Pleased with my result today placed 2nd with 71.86m”. And ahead of the Brityish Championships, she said: “Hopefully things will come together at the British trials at Alexander Stadium in Birmingham. “The British Championship is there to be won, and to qualify for the Olympics you have to finish in the top two or make the entry standard (71m) between May last year and July this. She feels her relationship with coach Tore Gustafsson is coming together nicely after three years working together: “Myself and my coach have taken time to really grow and work together well – it takes time to know what works best with me, and I’m getting older and wiser myself! “I’m learning a lot of things and it’s about putting it into training and competition.